We may love this Scriptural example of speaking life to dead things found in Ezekiel 37, but we have totally missed a key element in the reason for this supernatural resurrection! We have used this reference as a formula for declaring life into dead situations, relationships, and various issues in our life which needed resurrection power. Though faith is usually exercised in this pronouncement of life, I see another, more important factor that is behind the success of Ezekiel’s command. This was not a demonstration of prophetic authority but a powerful result of a PROPHETIC LIFE. We need to realize that Ezekiel came to that valley with a history – an amazing journey of surrender, radical obedience and a sanctified life. It is THIS key ingredient which makes Ezekiel’s pronouncement so incredible and the single most important ingredient that is desperately needed today in the Church. Without this ingredient, our prophetic pronouncements may be sincere and heart-felt, but lacking power. What is Ezekiel’s history? After Assyria conquered Israel, the Jews were scattered and Ezekiel lived with the other Jewish exiles in Babylonia. They were lost, angry and without cause. Though he was from a priestly line, the Lord called Ezekiel as a prophet to his people. Unfortunately, God not only told him that the people wouldn’t listen to him (2:4), but that things would get worse before they got better! The Jews would see Jerusalem fall before they were ready for God’s intervention. Ezekiel’s job was to warn his brethren about the impending destruction and call them back to God. – Prophesy death and destruction to his brethren (11:10-13). – Pack his belongings and hand dig through the wall to demonstrate what would happen to the Israelites in captivity (121-6). As if these things didn’t already test Ezekiel’s resolve to humble himself before the Lord in complete surrender and obedience, he was told one more heart-wrenching command. The Lord told Ezekiel He would take his wife “with one blow” to be a sign to Israel of what would happen to Jerusalem, their beloved city. Ezekiel was told he couldn’t even mourn her death (24:15-16). Here was a prophet who had faithfully obeyed every command of the Lord, willing to suffer ridicule, scrutiny and prophesy doom and destruction to his fellow Jews. Now, he was told that the love of his life would be taken from Him – as a SIGN. Scripture doesn’t indicate what Ezekiel’s initial response was. All we can assume is that he faithfully trusted the Lord’s directives just as before. The next chapter simply picks up with the next Word the Lord gave him. It is just 3 chapters later that we finally get to the VALLEY OF THE DRY BONES. This opportunity to see the power of God demonstrated before his eyes came AFTER years of obedience and faithfulness to God’s Word. It was not just the prophet Ezekiel who stood before those dry bones, but the man Ezekiel. This was one who had a history with his God, living out every request and following every directive he was given. THIS is the key ingredient that gave him the authority to speak to those dry bones in the valley of death. He had already been there and knew what to do. Because he had faithfully demonstrated humility, surrender and faith in God, those bones immediately responded to his words and a vast army stood before him full of resurrection power! I believe this is where we are in the Church today. 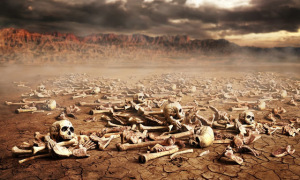 We have a huge valley of dry bones before us in our communities, cities and nation. We see biblical values dying, the decay of morals and absolutes as well as a complete absence of the fear of the Lord. We desperately need supernatural intervention, the power of resurrection life and a revival of passion for the Lord. Though we know that God can raise the dead to life, the question is: Can our prophetic declarations be backed up by a prophetic LIFE? Do our lives reflect consistent surrender and absolute obedience to what He’s already said? Have we so focused on the formulas of words or presumed rights to spiritual authority that we have totally missed the most important ingredient? The strongholds that we face today and the principalities that are threatening our communities and nation will not be overcome by a power confrontation. It will not be a test of the wills or the level of passion or the hours of prayer that will determine the outcome. The enemies of God will be defeated by a HOLY and HUMBLE people who have demonstrated the rule of God through their lives and practices. It is a righteous life that will totally disarm the enemy and release the power to bring new life. These are not just values, but heart issues that must be tested and tried, just as they were for Ezekiel.